Ladies and gentleman of the jury of the Superior Court of Gardening Crimes, have you reached a verdict? 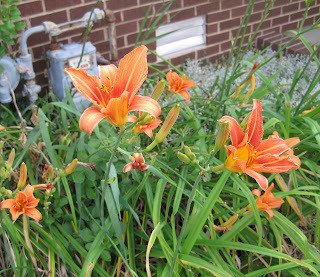 We find this flower, Hemerocallis fulva, which also goes by the alias "ditch lily" and occasionally "tiger lily", guilty on the count of proliferating itself throughout the country making it appear to be a native wildflower. The evidence is clear that it is from Asia! We also find this flower guilty of making a nuisance of itself by become an invasive plant in some areas! Thank you, members of the jury. Do you have a recommendation for sentencing? For the first count of imitating a native wildflower, we hereby banish it from our gardens. For the second count on becoming an invasive species, we hereby recommend that it be thrown out with the trash, and not be taken to the compost pile. Members of the jury, the court thanks you for your service and accepts this verdict and sentencing. Gardeners, please proceed as instructed by the court to remove this plant at once from your garden and throw it in the trash. The Ditch Lily has been a good bloomer during the worst drought we've seen since 1950-51, so I'm hoping it will hang on and prosper. Once it needs to be divided it will make a good pass along plant with friends. I guess you could say friends don't give friends Ditch Lilies but here we might have large bare patches to replace in the fall if this drought continues on. I appeal too!!! I never find it to be a nuisance...it just clumps well and makes new plants for me (like my loverly sedums)...give me your ditch lilies - I'll take them!! The Court Appeals affirms the judgment of the trial court. The evidence is clear and convincing that this plant is a pest. We also find that the trial court could have based its decision on the egregious hue of orange displayed by the defendant. The Court has forgotten that its legitimacy comes from the people and the ditch lily is definitely of the common people. Hence, the court should not be surprised when the peasants storm the mission and overthrow the haughty government. Give me H. Fulva or give me something just as hardy and carefree! As a Friend of the Court, I wish to plead for leniency and suggest that H. fulva's sentence be commuted to banishment to ditches and not total annihilation. In our locality she is too aggressive for civilized garden beds but performs a valuable horticultural function in those in-between areas that are neither truly wild nor adequately tamed. The Court must recognize that there is a difference between aggressive and invasive. I'd rather have their sister lemon lilies, anyway. Its here and it will survive well as the climate changes. Boom & Gary of the Vermilon River, Canada. I love this flower. It does not grow here, but I am sure it could. I would have a hard time with this ruling, though I must say you made a cute post of it. I think the ditch lilies better hire a better defense attorney.